At my startup Hiver, I encourage my employees to practice proactive procrastination; we have a ‘Procrastination board’ where any employee who wants to move a task to the next day pins it on for everyone to see. We don’t do that as a public humiliation tactic, we just do it to remind ourselves of the pending tasks and manage our inner procrastinators. What I have noticed is that anything that goes on the board is executed the very next day! 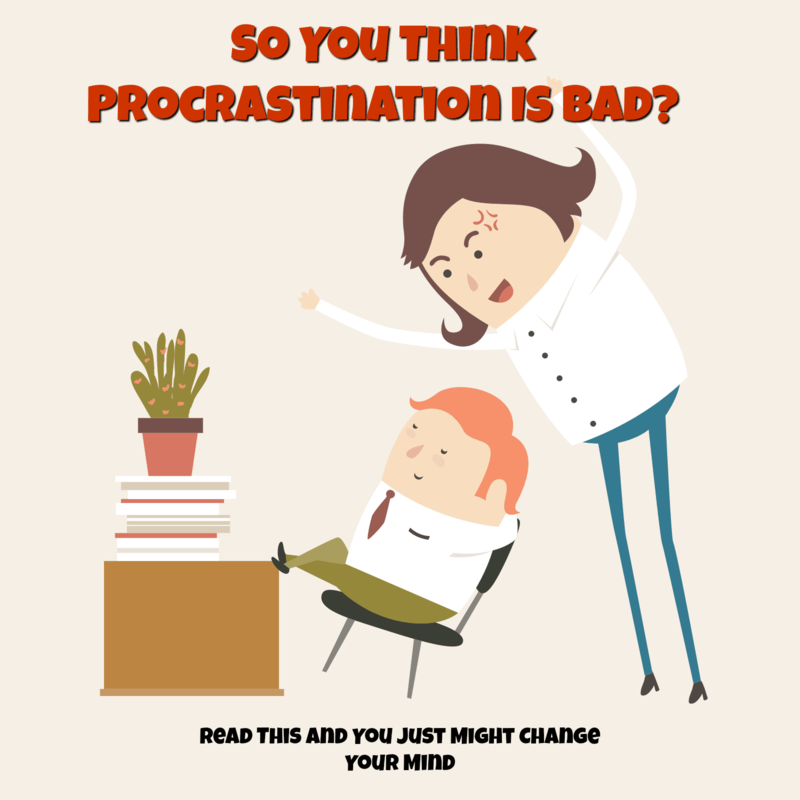 Most self-help gurus will tell you how to fight, or eliminate, or kill procrastination; although that is quite a noble goal, it is not something you can achieve permanently and so, a better thing to do is to mould yourself to become a proactive procrastinator. Know when you procrastinate - is it in the afternoon, or is it when you have to work on a finance related task, or is it when you are too far from the deadline? Plan the task accordingly. For example, when planning the day, allow yourself some time for procrastination, or let yourself take a number of breaks in between so that you don’t feel the intensity of the task. The Pomodoro technique is a good time management tool for procrastinators. It guides you to work in 25 min bursts of time, with 5 min breaks. Action tip: Use time tracking tools such as Rescuetime to understand your procrastination habits and patterns. According to Frank Partnoy, the author of the book ‘Wait: The art and science of delay', whenever we have a big decision to make, we must delay the final decision of yes or no to the very last minute. Why? When making a choice, many times, your rational mind and your intuition are saying two different things and you don’t know which one to follow. You will end up choosing to procrastinate on the task of taking a decision and during the time you are procrastinating you can evaluate the scenario thoroughly. Action tip: Figure out how much time you have to make the decision. Use all that time to evaluate the pros and cons of the decision and not to make the decision itself. Read each and every pro and con and ask yourself how you would feel about it. And then, just before the clock strikes, come to a decision. A study reveals that when we have a hard and complex task at hand, we automatically seem to assume that we have ample time to work on it. And when we realise that the deadline is getting too close, that’s when our panic button flips and we set to action. That’s why many of us procrastinate - we just like to work under pressure, although it seems stressful and frustrating, let’s admit it, we are more productive, efficient and better performers when we think we have to submit that paper in 2 hours. Action tip: So, now we know that you procrastinate because you like, or are used to working under pressure. In that case, go ahead and set a personal deadline for yourself to meet, which is much before the actual deadline. You can make your personal deadline tangible and easily push yourself to do it by offering yourself a reward if you met it. May be get yourself that watch you have been eyeing for so long! Procrastination can actually boost your creativity. More often than not, we put off tasks for later because it’s just too hard, boring or daunting. The idea of doing the task is just energy-sucking! But often what we don’t realise is that, even when we are not working on the task our subconscious mind is actively collecting ideas and thoughts that can help you with the task. So when you sit down to actually do the task, you are head is filled with a multitude of ideas and thoughts. This kind of sub-conscious brainstorming can help you become more creative at your task. Action tip: Nothing much really. Just enjoy the procrastination process instead of cursing it! In an essay written by John Perry, a professor at Stanford university, he says most of the time procrastinators are not doing nothing, they just put off the hardest and most complex task till the end. They tend to work on less taxing tasks first. This is a great practice, really. By checking of every other task on your list you will get a sense of satisfaction and will build your momentum by the time you reach that final task. When you do get there, you are in your peak productive state and with a sense of satisfaction from finishing all other tasks. Remember, just because you procrastinate doesn’t mean you are lazy or like to escape work. Action tip: Write down a well organized to-do list and mark the priority of each task on the list. If in the morning you cannot seem to push yourself to work on the most important task of the day, then put if off till a later time and start working on everything else on the list. The most important takeaway here is not really among the tips I just provided. Those are more like ways to help you figure out how to manage procrastination and take advantage of it. The real takeaway is this - self awareness. We all don’t procrastinate for the same reasons and in the same ways. Hence, it is terribly important to understand what your turn-off point is and find solutions accordingly. About the author: Niraj is the founder of Hiver (hiverhq.com), an app that turns Gmail into a powerful customer support and collaboration tool.